I've been keeping up with my bullet journal [if you're not sure what this bullet journal stuff is all about head here for an overview of the process!] fairly steadily for the past five months, my longest streak yet! That being said, I was in and out of town most of March, so my month was much more abbreviated than all the others. I kept up with my monthly calendar, but didn't end up logging my weekly/daily tasks. Traveling makes that tricky, and I honestly was so busy with non work things, I didn't really need a log to stay on task. Instead, I used my March pages to include a few quotes that resonated with me. I made things a little more creative by using last year's beautiful Rifle Paper Co. calendar as a backdrop for the quotes. They're a thicker card stock material, so it gives those pages a bit more weight, and reminds me to flip to those pages whenever I want to review them. 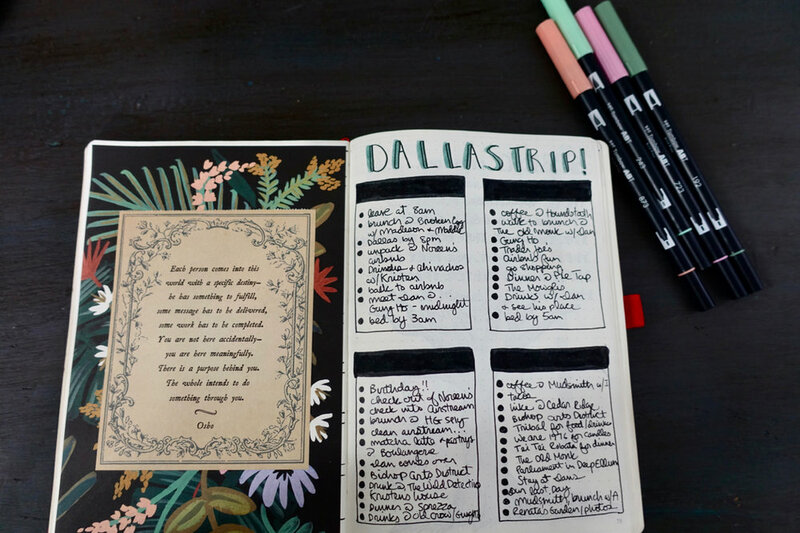 I also kept track of my first trip to Dallas, making quick notes of the things I did. 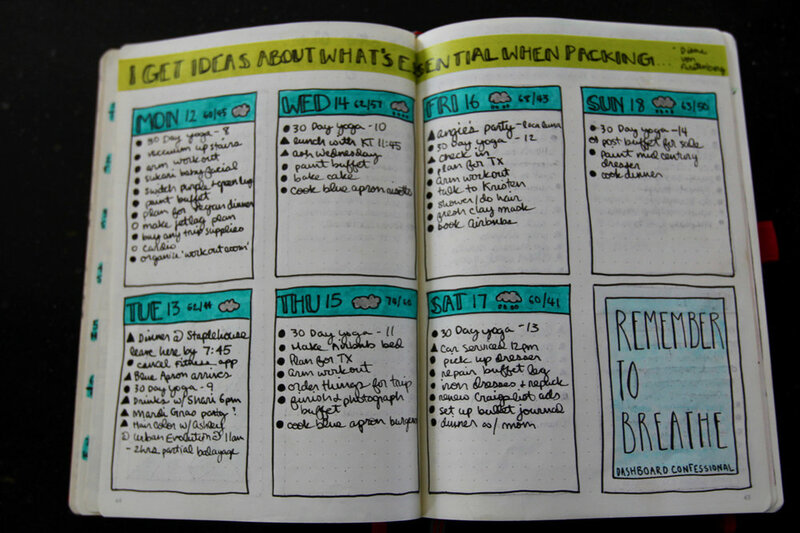 I tend to do that when I bullet journal while on vacation, so I can refer back to what I did each day, where I ate, even how much or more likely, how little sleep I got! I do love the flexibility that bullet journaling gives me. 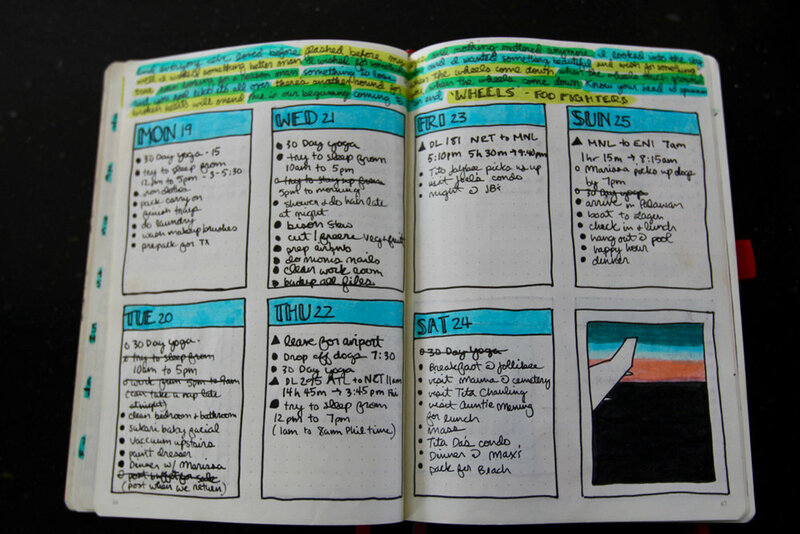 Had I purchased a traditional planner, I'd have to skip over and waste so many pages. This route is far more resourceful for someone like me whose months vary pretty significantly when it comes to work and travel. Yeah, it's April....about that...it's a LONG story, and it's far too much for a quick little post like this, but basically I've had a life changing last few months. I spent a couple weeks discovering the Philippines, where my mom is from and it was nothing short of incredible. I've been doing a good bit of writing when it comes to that trip and all the places we went, and in time I'll share some of that here. After the Philippines I had even more life changing things happen, but that's an EVEN longer story for another day [all good things I promise!]. 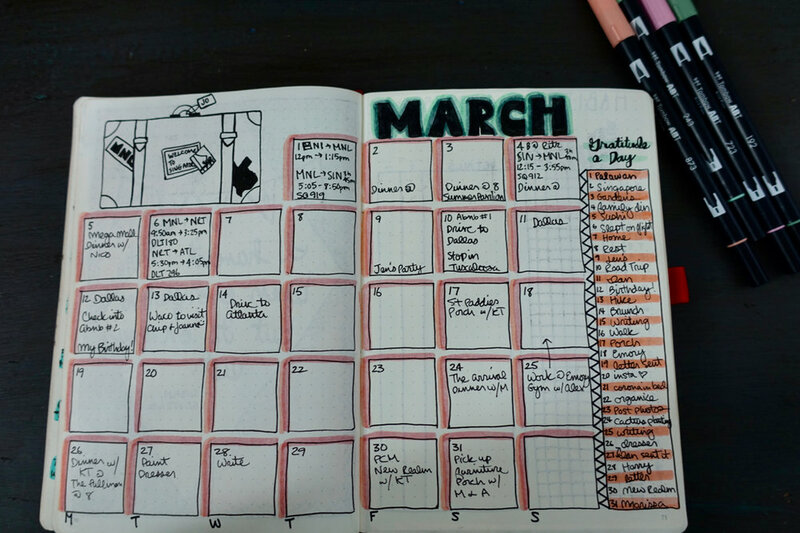 So for now, here's my February bullet journal flip through. So far it's my favorite month in the journal yet, mostly having to do with the fact that I started my cover page with lyrics to one of my RIDE OR DIE MADONNA SONGS. [insert crying emoji here]. I chose my colors and 'theme' with our trip to Palawan in mind. Palawan, a chain of islands in the Philippines is quite possibly the most beautiful place in the world, or at least the most beautiful place this girl has been to in her 30ish years! 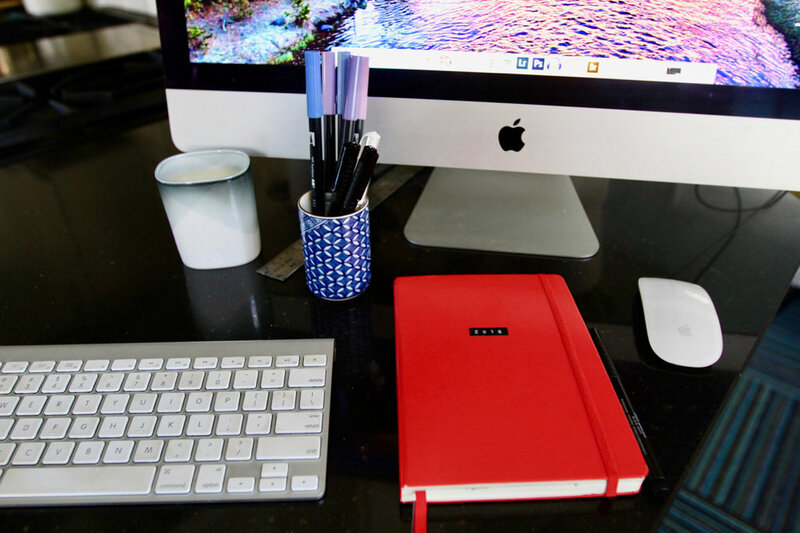 When it came to planning, I kept up with things for the most part, not so much with certain aspects of my tracking [ahem, sorry expense tracker, but you're a tricky one!]. March was a total wash, which I'll share next, but I do love looking back on the pages and reflecting on all the things I did over the month. Hope you enjoy my colorful month too! Even though I didn't write much in this monthly spread, I think it's the most beautiful one I've done! 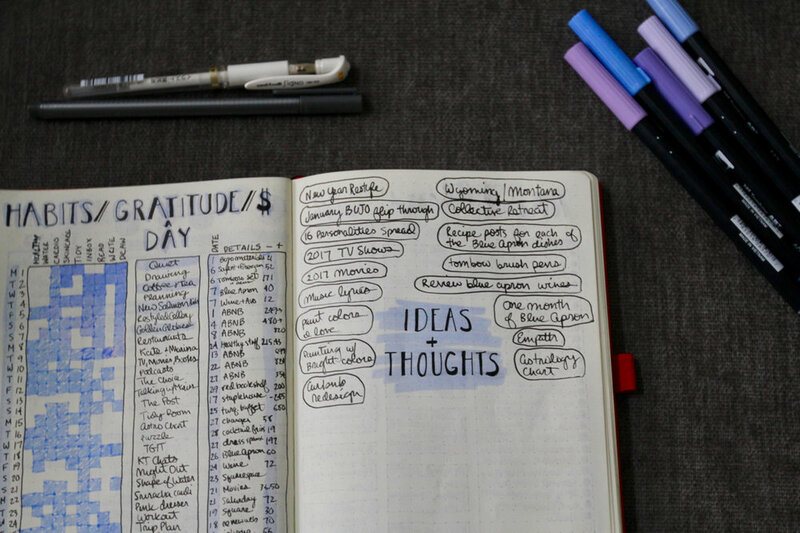 I did keep up with my gratitude a day log, and that's one of the pieces of this journaling habit I've actually kept up with the past four months. The top left is the big lagoon in Palawan and is far more stunning in person than my little doodles. I kept up with my habit tracker for the month, but expenses went straight out the window. It was tricky because I wasn't using my credit card while in the Philippines, and then just sort of forgot to fill it in...whoops. An ongoing task list is still a helpful spot to have, and I just need to work on writing out all my ideas [I've got TONS of them!]. I didn't end up tracking my food for the month. I'm realizing it's not that necessary for me to do this. I didn't do it for health reasons, it was more to remind myself of meals I love. 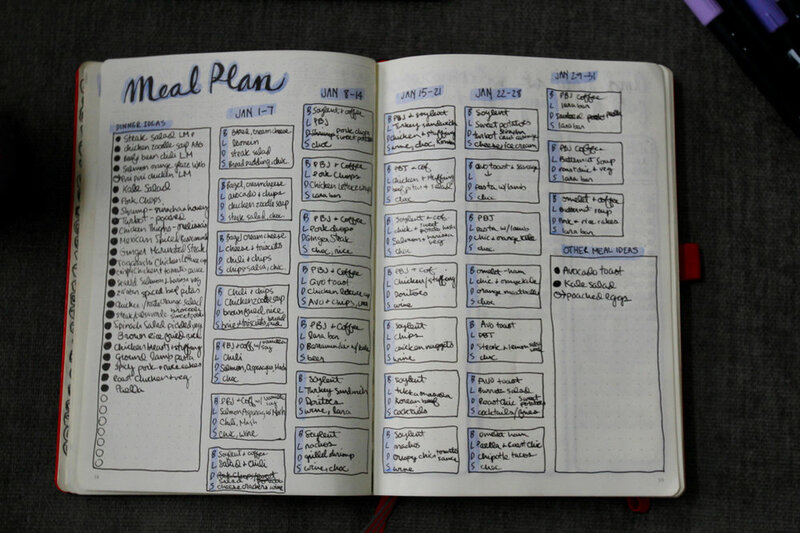 I do need to get better at jotting those down somewhere, so I'm thinking for May I'll do a simple page where I jot down tasty meals as they come along. The daily logs were incredibly helpful at the start of the month. I had a couple trips I was planning for at that time, so keeping myself organized was essential. Once we were leaving for the Philippines, having a timeline for each day was so valuable. We had lots of flights and information to keep track of, and this was the perfect spot for it. Once we were at the beach, my planning fell off, but I did jot down a quick note of the things we did that day. All the photos I took are far more valuable since they really take me through each day, but having a quick reference for what we did each day has been nice to refer back to. Bullet journaling is something I discovered at the end of 2016. I fell down the rabbit hole of infinite Youtube videos and blog posts detailing the magic and mystery behind the bullet journal. 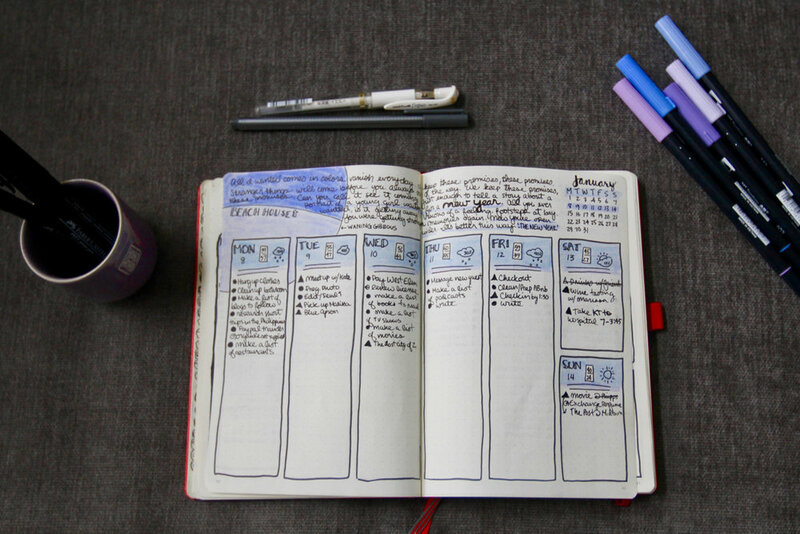 At some point maybe I'll make a tutorial explaining my own personal bullet journal system, but really, all you need to know is found on the OG website, bulletjournal.com. For me, having a bullet journal takes on two purposes. Ultimately, it's a tool that keeps me organized in all aspects of my life. I'm an eternal list maker. I make to-do lists daily, I keep lists of movies and music and words and lyrics and quotes and places. The list OF my lists could go on endlessly! I keep my many lists in all sorts of places; on random scraps of paper, in my phone, on the computer, in pretty little notebooks. My scatter brained self easily forgets about these various lists, and that lack of organization leaves me feeling uneasy. I get anxious at the thought of misplacing something, both physically and in my brain [which only seems to happen more the older I get, sigh!]. My personal and professional lives take on so many different interests and having a tangible resource where I can compile all my passions in one spot has been immensely satisfying. The other purpose for my bullet journal is to give me another creative outlet. I'm a naturally creative individual, who can't really go a day without painting, drawing, writing. The bullet journal gives me a space to itch that creative scratch. It can be as insignificant as coloring in the little boxes on my habit tracker, or spending some time drawing out a cover page [see below]. Bullet journals really don't need to be aesthetically pleasing, but for me, incorporating color and a bit of art is what makes it all the more fulfilling. I don't spend hours crafting the most beautiful pieces of art in it [though there are many people who do!]. It's just relaxing and comforting to carve out a few minutes out of my day to create this functional, beautiful journal for myself. If you're at all curious what one month in a bullet journal looks like, check out the photos below. I didn't include all the pages I've worked on here [by the end of January, I'd already made it to page 51, eee!] 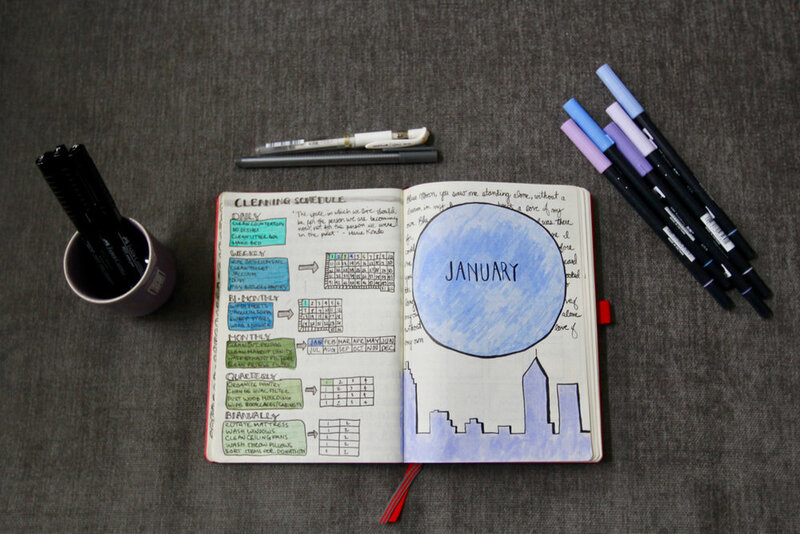 but this should give you an overview of the basics of a bullet journal. There was a super blue moon this month, so I drew out a gigantic moon, wrote out the lyrics to 'Blue Moon' [because of course] and drew a bit of the Atlanta skyline. I kept with my moon theme and drew out the phases of the moon at the top. I didn't keep a monthly task list like I'd planned, since writing them out for the week or by day just suited me more. SO many things crammed into one space! The habit tracker was a challenge for me, but it was helpful in having me see which things I really need to focus on in the next month. Gratitude a day is basically where I write one or two words on something that stood out that day for me, something that made me happy in some small way. Money tracker was another hard look at how much I spend, but also how much I make [which was slightly redeeming!]. The ideas and thoughts page I didn't use as much as I'd hoped. I spent most of January getting back into the swing of work after the holidays, and getting myself organized for the year, so I'm hoping February I can focus more on this section. I honestly didn't eat as healthy as I'd have liked in January, but having a spot where I can reflect back on the good [and bad!] choices I made, and also plan out meals for the week has been really helpful. This is where I compile most of my to-dos for the day/week. I didn't necessarily write everything I tackled down, though I'm trying to do that more as I start on February! I like to leave a space for a quote at the top, and this one I grabbed from my Rifle Paper Co. Calendar. I kept the same set up for the entire month, just to see if this would suit me. 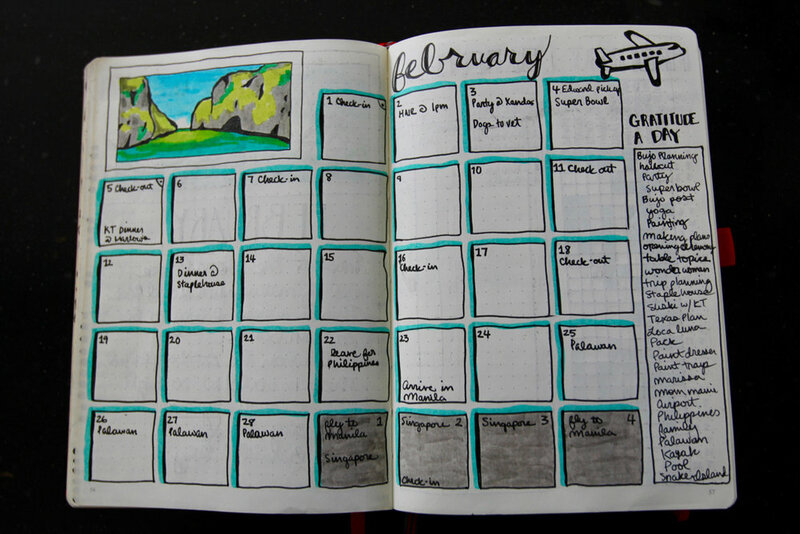 I've made a few tweaks for February, but generally I like this layout. This week I wrote down the lyrics to one of my favorite Beach House songs, The New Year. Same layout and another quote, this time continuing with my 'moon' theme. I'd never read this quote before, but it really resonated with me. Final full week of the month, and another quote with a little bit of lettering practice. I'm left handed and lettering is a constant test in my ability to not smudge the words! I only wrote out the last three days of January here, and then continued the rest of the week in my February calendar. As a little treat to myself, I wrote out my astrology chart. It's something I'd never looked into before, and I couldn't believe how accurate the descriptions were! It's a nice page for me to look back on and reflect about, though the incredibly tiny writing definitely gave me a strained hand! I adore my Tombow Dual Brush Pens for all things color, and my current writing pens are the Faber Castell Artist Pitt Pens. The journal I use is the Leuchtturm1917 dotted A5 and I highly recommend it!